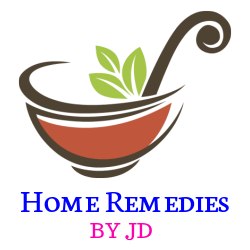 High uric acid home remedies: in this post, I will share natural ways to reduce uric acid fast. A high level of uric acid in the blood is also known as “hyperuricemia”. This disease occurs when the excess amount of uric acid is not passing through the kidneys or increases the production of uric in the body. 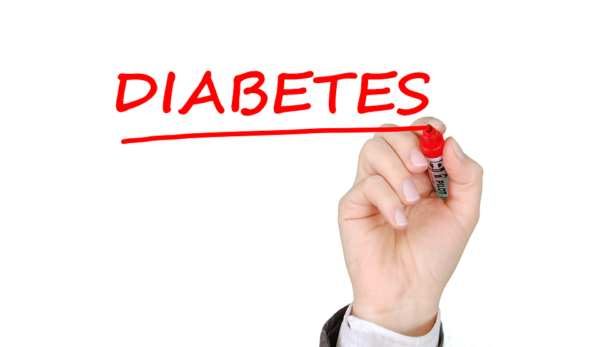 Later, it wills additional cause some health issues like kidney stones, renal disorder, gout, and arthritis. A recent study found that high uric acid level in the body is also associated with the heart-related disease and hypertension too. Some of the main cause to the increase the uric acid level in the body such as consumes foods rich in purines, obesity, endocrine, thyroid, drink excess alcohol, diabetes, genetics and some other physical conditions. The first thing you should follow is the change in your diet plan. 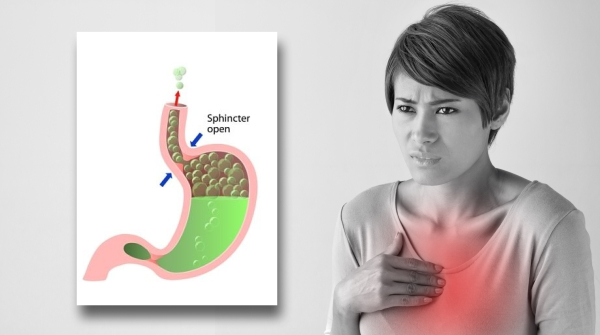 Uric acid is formed by the breakdown of the purines chemical, so you should avoid that foods which high in purines, like fish, organ meats, beer, alcohol and poultry products. Beans, mushrooms, legumes, and yeast are also rich in purine. Wheatgrass is the most effective home remedies for a high uric acid level in your blood. It can reduce the acidic level and restore the alkalinity of blood. Furthermore, it is a great source of vitamin C phytochemicals and chlorophyll that helps to increase detoxification. Drink the mixture of 2 tablespoons of wheatgrass juice + juice of 1 lemon every day until you get the desired result. Drink 2 glass of skim milk every day can help to decrease the uric acid’s re-absorption as well as increase its removal through your kidneys. The low-fat milk dairy product reduces the risk of gout. You should also add a yogurt and other dairy product to your diet. Consuming dairy products daily is the best high uric acid home remedies, which you should consider. This is the most effective ways to reduce high uric acid from your body. Dietary fiber-rich food will absorb the uric acid and then eliminate it. Finally, it will throw out from your body and its level will gradually decrease. You should include whole grains, apples, orange, pears, and strawberries in your diet. All these foods contain a high fiber. 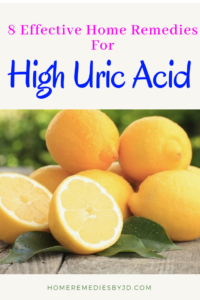 This is the simplest remedy to treat high uric acid. Everybody can apply it easily. Drinking lots of water daily can enhance the filtering process of uric acid. It will facilitate to dilute the uric acid and stimulate your kidneys to flush out the excessive amounts of acid from your body through body waste. Drinking enough water in a regular interval can also reduce the risks to getting recurrent gout attacks. Drink at least 8 – 10 glass of water every day. Including banana in your daily diet will help you to decrease the uric level as it is a rich source of vitamin C. It helps in converting the uric acid into dischargeable liquid form, and then, later on, it is filtered by kidneys and passes through your urine. So it reduces the residual uric acid to crystallization in your joints. 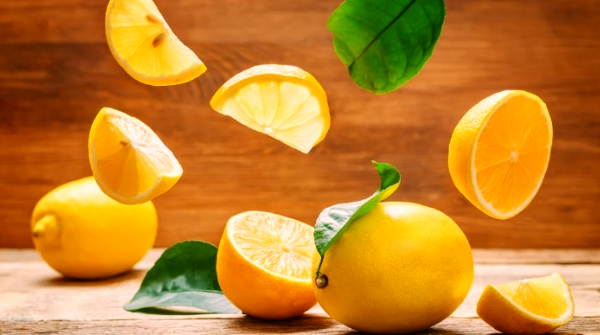 Lemon is a great source of the vitamin C. The juice of a lemon can provide an alkaline effect, which helps to regularize the uric acid levels in your body. The rich source of vitamin C can help you to minimize the uric acid levels too. Drinking a lemon juice on an empty stomach every morning. Add a 1 lemon’s juice into one glass of warm water and drink it daily for least 2 – 3 weeks. It is a natural cleanser and detoxifier, therefore it helps you to remove uric acid from the blood. It contains the malic acid which helps in breaking down the uric acid and removes it from a body. Mix Only 1 tablespoon of organic Apple cider vinegar (ACV) in a glass of water and drink it daily for two times is recommended until you get the desired result. Note: Please avoid consuming an excessive amount of ACV because it lowers the potassium level in the body. Finally, you know the best high uric acid home remedies to cure this health problem. Previous articleIf you Drink almond milk with honey? These Things happen to your body.